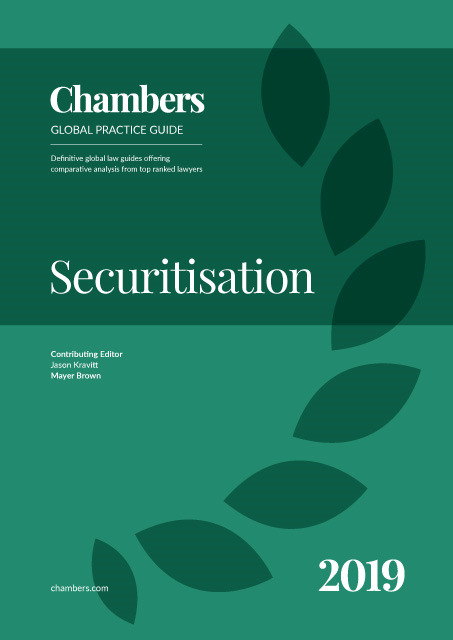 The Securitisation 2019 guide provides expert legal commentary on key issues for businesses. The guide covers the important developments in the most significant jurisdictions. Mayer Brown LLP Mayer Brown is a global law firm advising clients across the Americas, Asia and Europe. Our presence in the world’s leading markets enables us to offer clients access to local market knowledge combined with global reach. The firm includes about 900 lawyers in the Americas, 250 in Asia and 350 in Europe. Our presence in Asia was enhanced by our combination in 2008 with Johnson Stokes & Master, one of the largest and oldest law firms in Asia. This unequalled on-the-ground presence in the world’s leading markets for legal services enables Mayer Brown to offer clients access to local market expertise on a global basis. Mayer Brown is noted for its commitment to client service and its ability to assist clients with their most complex and demanding legal and business challenges worldwide. The firm serves many of the world’s largest companies, including a significant proportion of the Fortune 100, Eurostoxx 100, CAC 40, Dow Jones and Hang Seng Index companies, and more than half of the world’s largest financial institutions. The Ten Commandments, which are considered by some to be the foundation of Western civilisation’s Moral Code, contains about 200 words. The Constitution of the United States of America is a small amount over 7,000 words. But the Proposing Release for the US Credit Risk Retention Rule for the United States is approximately a quarter of a million words. This gives the reader some sense of the scale of regulations imposed on the securitisation industry after the financial crisis of 2007-2009. While the US has begun to scale back its new regulatory scheme in modest ways, the European Union has continued to expand and fill out its own regulatory scheme for securitisation and countries such as China have continued to elaborate and expand their own regulatory schemes. Notwithstanding the above, or because of it, depending on your point of view, the annual volume of securisation issuance has continued to grow significantly once the industry began to recover from the financial crisis. This Global Practice Guide (“Guide”) is intended to serve as a practical means by which legal practitioners may deal with this industry growth. Over the ten years since the beginning of the financial crisis, the most important development for securitisation, anywhere and everywhere in the world, has been the creation of a vast and complicated regulatory scheme that attempts to rein in securitisation’s perceived weaknesses and to strengthen its valuable structures, purposes and uses. Accordingly, much of this Guide is an attempt to alert legal practitioners to the scope and content of these new rules, whether they are being modified, filled out, or added. In composing the questions that call for the answers presented in this Guide, we have attempted to give the legal practitioner a thorough guide to the types of issues that may arise in any country for securitisation and a basis for beginning to structure most of the kinds of securitisations that issuers may use in the actual market place. We have also tried to focus on the real issues that may arise in order to make this Guide itself a practical one. We begin by summarising the ways that various types of laws of general application will almost certainly affect securitisation transactions. We focus on insolvency laws, collateral transfer and lien validity laws, tax laws and other similar relevant laws. We also discuss the types of opinions that legal practitioners typically will be asked to deliver on account of the effects of such laws. We then move to the most difficult topics in this Guide, the content of regulations and laws that have been adopted specifically relating to securitisation since the financial crisis. These include regulations on disclosure, retention of credit risk for sponsors or originators, periodic reporting, rating agency regulation, capital and liquidity requirements related to securitisation, derivative regulation related to securitisations such as interest rate and currency swaps applicable to Special Purpose Entities (“SPEs”) and credit default swaps, rules for compliance with regimes such as “Simple, Transparent and Comparable” created by IOSCO and the Bank for International Settlements, and their effect on required capital and liquidity, rules similar to the so-called “Volcker Rule” in the US, rules that regulate banks with regard to securitisation, rules regulating the form of SPEs, rules on credit enhancement, rules governing investments in securitisation by different types of entities such as pension funds, and, if appropriate, accounting rules for sales (vs secured loans) and consolidation of SPEs. We also examine enforcement of the new rules and applicable legal opinions. After regulatory review, we turn to documentation. Here, we focus on provisions for the transfer of financial assets themselves, representations and warranties, covenants, defaults, indemnities and remedies. Again, we include provisions on legal opinions. The next topic is the roles and responsibilities of the parties to securitisations. We examine material responsibilities, obligations and rights of issuers, sponsors, underwriters and placement agents, servicers, investors and trustees. Finally, we conclude with common structures for different types of financial assets commonly securitised. These include retail and dealer auto receivables, auto leases, equipment receivables, consumer credit receivables, market-place lending, revolving credit such as credit cards, commercial and residential mortgages, trade receivables, CLOs, and whole-business receivables. Of course, the above summary is just that, a mere summary servicing as a portal to the extensive information that you will find for 22 countries in the following Guide itself. We welcome questions, comments and suggestions for improving this Guide as new editions are published from year to year.